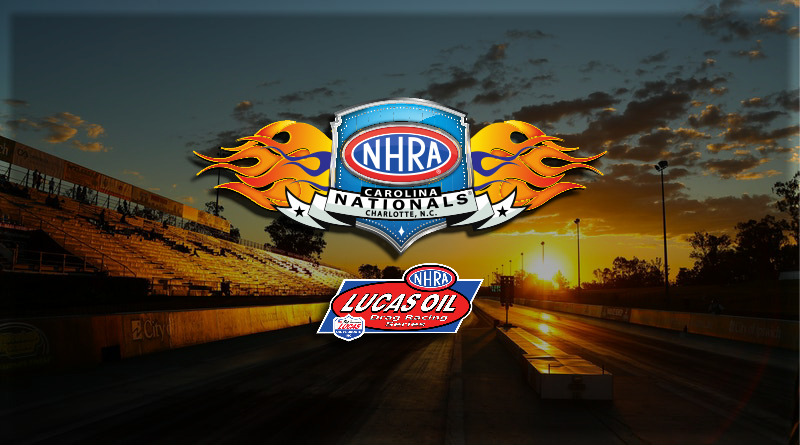 CONCORD, N.C. – Saturday was raceday at the NHRA #CarolinaNats hosted by zMax Dragway. The day began and ended with tons of sportsman racing action and by the end of the day, only the two finalist remained in Competition Eliminator, Super Stock, Stock Eliminator, Super Comp, and Super Gas. There are two rounds of racing remaining for the Top Sportsman and Top Dragster competitors who will race to a champion on Sunday afternoon. With so much racing on Saturday our DragChamp pre-event picks took a beating but we still have a couple of racers in contention to take home the Wally on Sunday and keep our win streak alive. Click here to see our pre-event picks. David Rampy will have to wait until Las Vegas to have another shot to capture national event win number 100 as he fell in round two at Charlotte. We will have a first time national event champion tomorrow as both finalist, Art Hodges and Danny Holt, will be competing in their first final rounds on the big stage. In Super Stock the story coming into the race was Brandon Bakies’ national championship pursuit. After his win in Dallas last week, Bakies made the long haul to Charlotte looking to improve on a fourth round finish. Bakies came up short in his second round matchup with Shane Oaks. Both racers put up .036 packages with Bakies coming up .0005 short. Brandon will need to do a little more traveling over the next few weeks if he wants to catch current points leader Justin Lamb. Team DragChamp was out early as Byron Worner, Anthony Bertozzi, and Dan Fletcher failed to make it to the late rounds. Racers who did have a stand out day included Joe Lisa and Herbie Null Jr. who both made the final round. Both are experienced Super Stock competitors with tons of final round experience so look for this to be a good drag race tomorrow afternoon. Team DragChamp is alive and well in Stock Eliminator as Anthony Fetch is carrying the torch once again. Fetch was one of the DragChamp picks at Reading last month and he almost brought home the Wally after a runner-up finish. He’ll face Terry Taylor in the final round on Sunday. Fetch also made moves in Super Comp lasting until the semifinals before bowing out. My other two pre-event picks included Dan Fletcher who lost in the opening round and Daniel Young who fell in the third round. The big story of the class was revolved around national points leader Chris Garretson as he looked to improve on a second round loss. Chris did make it to the third round before falling to Corey Manuel. In doing so, Chris added 10 points to his national total which extended his points lead over Don Nichols. With one more race to claim, Garretson will head to the Division 2 LODRS race at Rockingham next week as he looks to lock down his first national championship. Speaking of Corey Manuel, he will carry the DragChamp banner into the final round tomorrow when he faces Super Class star Tom Stalba in the final round. I believe this will be Corey’s first NHRA national event final and it will be the 15th for Stalba. Both racers have been killing the tree and running close to the index so it should be a great final. As far as my other two pre-event picks go, John Labbous fell in the fourth round to Stalba and Jason Kenny fell in the early rounds. A number of Super Gas competitors came to Charlotte looking to improve their national points total and all fell short. Ray Sawyer, currently No. 2 in the world, fell in round two while Jim Perry, Iggie Boicesco, and Steve Hoyt all failed to improve upon their previous national event finishes. With no one improving this weekend, I’m sure the current points leader Devin Isenhower will sleep a little better tonight. Two racers who are happy at the end of the day included Phil Smida and Joe Fisher who both earned a spot in the final round. Smida is a multi-time national event winner while Fisher is looking for his first national event win in his second national event final round this year. Team DragChamp fell early when Steve Hoyt fell in round one, Steve Furr fell in round two, and Rusty Cook dropped out in round three. National points contender JR Lobner did just what he needed to pass current points leader Doug Crumlich after he made it to the third round on Saturday. Although he fell in the third round, he picked up nine points which will put him three points ahead of Crumlich. Although Lobner passed Crumlich in the standings, third ranked Ronnie Proctor will pass both competitors as he has the scheduled bye in the semifinals tomorrow which will guarantee a final round appearance. By making the final round, Proctor will take over first place in the national points standings. With Proctor receiving the bye in the semifinals, Dylan Stott and Jackie Robison will face off tomorrow to see who will meet Proctor in the final round. As with most classes this weekend, Team DragChamp didn’t fair well in Top Sportsman as both John Taylor and Lester Johnson fell in the early rounds. Just four competitors remain in Top Dragster as Team DragChamp’s Jeff Strickland will pair up with J.B. Strassweg and Anthony Bertozzi will pair up with Angie Travis in tomorrow’s semifinal round. Looks like I should have picked Bertozzi in Top Dragster instead of Super Stock. Visit DragChamp daily to catch the latest NHRA sportsman class updates and drag race results. DragChamp is sportsman drag racing.